Here’s our very own list of the top 10 Greatest NBA Players to ever play the game with a few honorable mentions. This list includes the best players in NBA history along with the top basketball players today. Here the list of Top 10 Greatest NBA Players. Of the thousands of men who have played in the NBA over the past six decades, most have been forgettable. Many have been excellent at one or two skills. Some have been champions. Only a small group have become legends. At #10 Among All Time Best NBA Players, “Akeem The Dream” The smoothest big man the league has ever seen. Olajuwon could do absolutely anything he wanted on the offensive end, and blocked shots at a high rate to boot. Hakeem Olajuwon was an NBA MVP, two-time NBA Finals MVP, and three-time NBA blocks champion. He holds the NBA record for blocks at 3830. At #9 Among Greatest NBA Legends, One MVP and two scoring titles in his career. got his fourth ring as Dwyane Wade’s giant sidekick in Miami and stuck around long enough to make 15 All-Star teams and also rank fifth on the league’s career scoring list. During Shaq’s prime, there wasn’t anything on earth that could slow him down except that darn free throw line. His size and strength made him a nightmare for defenses. Shaq was a guy you could build a team around and win 60 games. He was an irresistible force around the basket, leading the Lakers to three titles. At #8, according to All-Time NBA Ranking, His style of play is simple and down to earth. Nothing flashy, Duncan stays quiet on the court but his accomplishments speak for themselves: two MVPs, four titles, 13 straight seasons on both an All-NBA and All-Defensive team. turn around bank shot is his Trademark Shot. Duncan was and still is, a once in a lifetime defender and leader. also is by far the greatest power forward in the history of basketball, With All His Achievements he is the most under-appreciated player basketball has ever seen. At #7 Among Greatest Basketball Players, The 7 foot 1 inch Wilt, ‘The Stilt/Big Dipper’ Chamberlain statistically was Most dominant player the league will ever see. Seven scoring titles, 11 rebounding titles, four MVPs and a 100-point game. He is one of the best players around to be Top Scorers In NBA Playoffs. He is unstoppable, and the best big man of all time. At #6 Among Best NBA Players, Formerly a high-flying dunker, James is now a prolific jump shooter and phenomenal defender. Highest Paid NBA player His confidence translates to him taking control of late-game situations and his game-winning shots are always mind-blowing. He is one of the Most Point Scorers In NBA History. At #5 Among Greatest Basketball Players, 12-time NBA All-Star and was named the league’s Most Valuable Player (MVP) three times. Won 3 NBA titles, 3 MVP awards, Olympic Gold. The first member of the 50/90/40 club, He played his entire professional career for Boston, winning three NBA championships. Bird was one of the most entertaining and confident players to suit up in the 80s, was the most versatile forward to ever play the game. Larry was one of the greatest shooters and most clutch player in history. He could beat you without scoring. He helped put the NBA on the national television map with his rivalry against Magic Johnson. At #4 Among Greatest NBA Players, NBA’s all-time leading scorer Kareem Abdul-Jabbar is a retired American professional basketball player. He has played in the NBA for two full decades. Won 6 NBA Titles, 6 MVP awards and Still Owner of all-time scoring record(38,387 points). In the 1970s, he was the best player in the league. He unleashed the most devastating shot the NBA has ever seen, using the skyhook to score many of his league points. He is clearly one of the Best NBA Players. At #3 Among Greatest NBA Players, Magic Johnson the winner of 5 NBA titles, 3 MVP awards, Olympic Gold, NCAA title and High School title. With 9 times inclusion in all-NBA first team, he is widely considered as one of the greatest of basketball. Johnson’s passing ability was simply surreal, He made the art of passing fashionable in the NBA. No 6’10″ player should be able to play point guard with such grace and skill, yet Magic broke that unwritten rule. Magic Johnson was the only player who one-upped Larry Bird during the 80s. If he didn’t share an era with Larry Bird, Johnson surely would have won more than five championships and three MVPs. He would have owned the ’80s by himself. At #2 Among Greatest Basketball Players, It’s true that Russell played with a lot of great players, including Bob Cousy, Bill Sharman, and Tommy Heinsohn. He played during a time when it was difficult to be an African-American in the city of Boston. A Great Defender Great Rebounder. He is among the Oldest NBA Players Still In Action. he Won Eleven championships in 13 seasons a feat unmatched in major American sport. Also Won 11 NBA titles, 5 MVP awards, Olympic Gold and I believe an NCAA title at San Francisco. At number 1 Position in Best NBA Players of All Time , Legendary Michael Jeffrey Jordan. What he did for the game of basketball was unparalleled and very few argue where he belongs. MJ is the greatest basketball player this world has ever seen. He entertained with his aerial exploits, awed with his competitive fire and charmed with his extraordinary charisma. He won six championships against John Stockton, Karl Malone, Charles Barkley, Hakeem Olajuwon, and other Hall-of-Famers. Also Won five MVPs and 10 scoring titles, Jordan simply adjusted his game and got better. He was the ultimate leader, the ultimate scorer, and the ultimate defender. Every aspiring basketball player of the 90s donned his signature jersey and shoes, and the Chicago Bulls became the iconic team of basketball. He surely is the Greatest Basketball Players in History. How can this list be completed without mentioning the name Kobe Bryant? The 6’6″ NBA superstar is decorated with several amazing accolades which include 2 times NBA Finals MVP and 4 times NBA All-Star Game MVP. 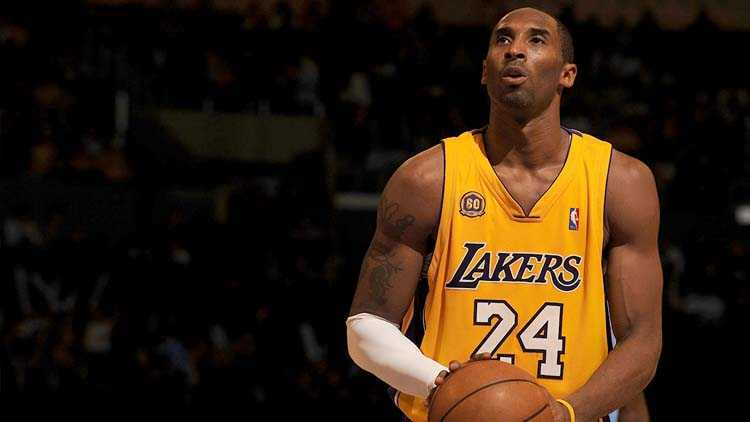 He holds the record for playing with one NBA franchise for the highest number of seasons, as he has only played for Los Angeles Lakers ever since he started his NBA career. Kobe became the youngest player to reach 30,000 career points in the league at 34 years of age. He became the NBA scoring champion twice in his spectacular career and also became the NBA Slam Dunk Contest champion in 1997. This shooting guard is also the Los Angeles Lakers all-time leading point scorer. Sports Show Editorial Team has compiled this list while keeping in mind about their accolades and achievements. Please share your thoughts about this list of Top 10 Greatest NBA players in the comment box below.